Steam is becoming one of the most popular methods to clean in almost every industry. Steam helps sanitize everything from ovens to urinal floors, kennels to care homes, nooks, crannies, cracks, crevasses and everything in between. Put simply, steam is so popular because you can see the dramatic improvements almost instantly. With many environmental benefits, let's first look at the before and after effect of Steam Only, Steam & Vacuum and Steam Detergent & Vacuum. Steam cleaning is very effective in the food industry. For instance steam loosens burnt on dirt, which can then be scraped and hovered off as the picture below shows. This process can be repeated on things like oven doors and stove tops to dissolve grease stains as the steam forces tough dirt to loosen up, rather than just compounding the burn, which gives you the chance to wipe away the bacteria and germs at source. The beauty is that you may be considering buying expensive replacement cooking appliances because after a build-up of dirt it is no longer fit for purpose. However, it may only require a simple deep steam clean to return your cooking appliance back to former glory, with plenty of years left in them, saving you time, money and a lot of elbow grease. Steam kills bacteria, mildew and viruses on contact and when used in toilet to remove odours and reduces the use of harsh chemicals which can damage surfaces and people who come into contact with them. But anywhere with grouting can benefit such as pool areas and pretty much anywhere in a gym from the machines to the showers. The powerful sanitizing results of steam mean it is more commonly used in more formal settings, a host of environments including schools, nurseries, healthcare facilities and care homes. The wide ranging advantages of steam mean that it can be used on bed rails, table tops, drapes and all forms of upholstery. As you can see hidden within the fabric of chairs, carpets and bedding, can be shocking amount of dirt. However, steam extraction quickly and efficiently liquefies and removes the dirt, killing dust mites in the process, leaving the fabric cleaner and more colourful. Saving the pennies is important, but so is saving the planet and with steam you can do just that. 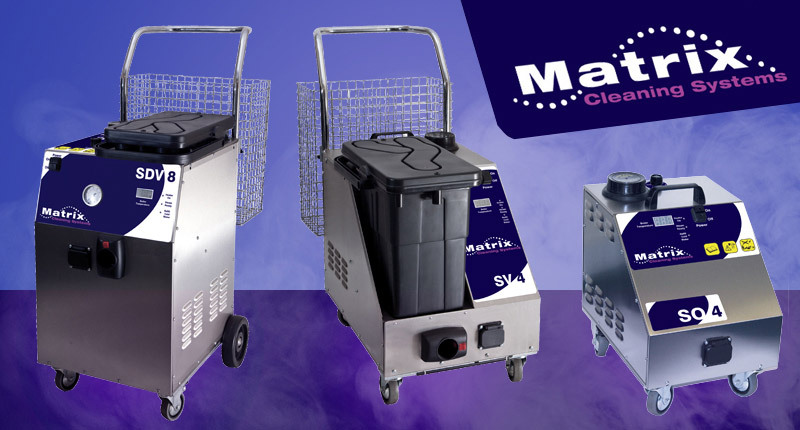 DEFRA approved technology means our range of Matrix range means that these machines are approved by a respected body to have water saving technology. By introducing steam into your cleaning methods you can save on the use of harsh chemicals by up to 80% and conventional water usage is reduced by up to 95%.